« Are You Headed to Atlanta for the Americas Competitiveness Forum? This week I led 14 U.S. companies on the first trade mission to Iraq since the end of combat operations. It was very exciting to facilitate the connection between these firms and potential buyers in Iraq. I also met with many of my counterparts to engage and enhance the commercial dialogue between the United States and Iraq. I am honored to bring with me companies from Washington and California, New York and Michigan to meet with Iraqi businesses and government ministries who are poised to capitalize on a vast array of infrastructure and construction projects planned in the near future. Iraq’s government has budgeted more than $80 billion for infrastructure development, including projects constructing highways, railways, telecommunications and defense. Iraq’s private sector also offers opportunities in oil and gas, construction and communications technology. The United States and Iraq have entered a new phase of commercial engagement, and I am confident that the recent transition will lead to a stronger economic relationship between our two nations. This trade mission that I am leading is a symbol of the U.S. commitment to develop a lasting friendship with Iraq based on mutual respect and shared interests. 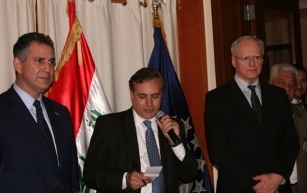 This marks the beginning of a new commercial relationship between the United States and Iraq. During my time here I’ve met with Deputy Minister of Trade Walid Habib Al-Moswee, Dr. Hussain Al-Shahristani, Iraq’s Minister of Oil and Acting Minister of Electricity, and Dr. Sami Al-Araji, chairman of Iraq’s National Investment Commission. My hope is that the meetings we’ve had will be the first of many in the coming months. During my meeting with Dr. Al-Shahristani, I advocated for continued negotiations between the federal and provincial governments on energy issues and passage of the Hydrocarbons and Electricity Laws by the Council of Representatives. These actions would establish the rule of law in the energy sector and support a legal and regulatory environment more conductive to international investment in Iraq. These reforms should encourage more U.S. companies to enter Iraq, as the reduction in risk and further clarity would lower the costs of operating here. Some of my discussions with Dr. Al-Araji included the benefits of ratifying several outstanding bilateral agreements that would assist Iraq in achieving a sound investment climate and expanded regulatory reforms to promote investment. I also stressed the importance of Iraq continuing to move forward on WTO accession as a part of the country’s efforts to integrate into the global multilateral trading system. All of this attention on improving the economy and investment climate in Iraq will ultimately benefit the Iraqi people and help to integrate Iraq into the global economic system. The companies who traveled with me have participated in nearly 170 meetings with prospective clients in Iraq. As Fox Business News described it, it’s like speed dating for business. The potential for doing business is certainly plentiful.